Part 5 of Pawanmuktasana Series 1 concern with shoulder and elbow joints. These asanas are very important for people who have to sit for long hours in the office and those who have to do a lot of driving. They are also very helpful in cervical spondylitis and frozen shoulder problems. Sit in any comfortable pose but with the spine in the upright position. Inhale and stretch out both the arms straight in front of the body at shoulder level. Open the hands with the palms’ face up. Exhale and bend the arms at the elbows and touch the fingers to the shoulders. The arms should be parallel to the floor and to each other. Straighten the arms again returning to the initial position. Maintain the awareness of the movement of the elbow joint and arm muscles. Repeat the same process 3 to 5 times. Place the fingers of the left hand on the left shoulder and the fingers of the right hand on the right shoulder. Rotate both elbows at the same time in a large circle. Touch the elbows in front of the chest. Inhale, move the arms up and try to touch the arms with the ears. Stretch the arms back in the backward movement. Exhale on downward movement and touch the sides of the trunk on complete exhalation. Practise 3 to 5 clockwise rounds and 3 to 5 anti-clockwise rounds. Awareness should be on the breath and the stretching sensation around the shoulder joint. Interlock the fingers of both hands and put them on the navel. Rotate both shoulders at the same time in a circle. Inhale on upward movement and exhale on downward movement of shoulders. Awareness should be on the breath and the shoulder joint throughout the practice. Shoulder asanas are very good in cervical spondylitis and frozen shoulder problems. Regular practice of these asanas helps in maintaining the shape of the shoulders and chest. Being a part of Pawanmuktasana series 1, these asanas warm-up and prepare the body for more intense yoga poses. 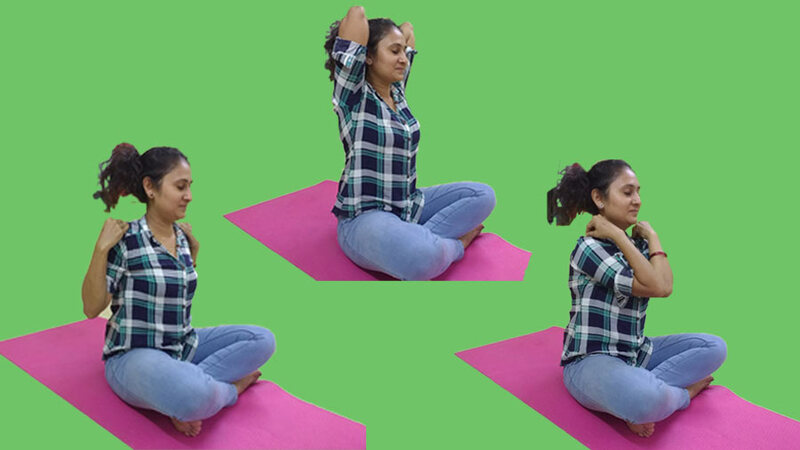 These asanas are good for flexibility of the shoulder joints and remove the muscle strain. Shoulder and Elbow asana reduce stress and anxiety and great for office people and students.